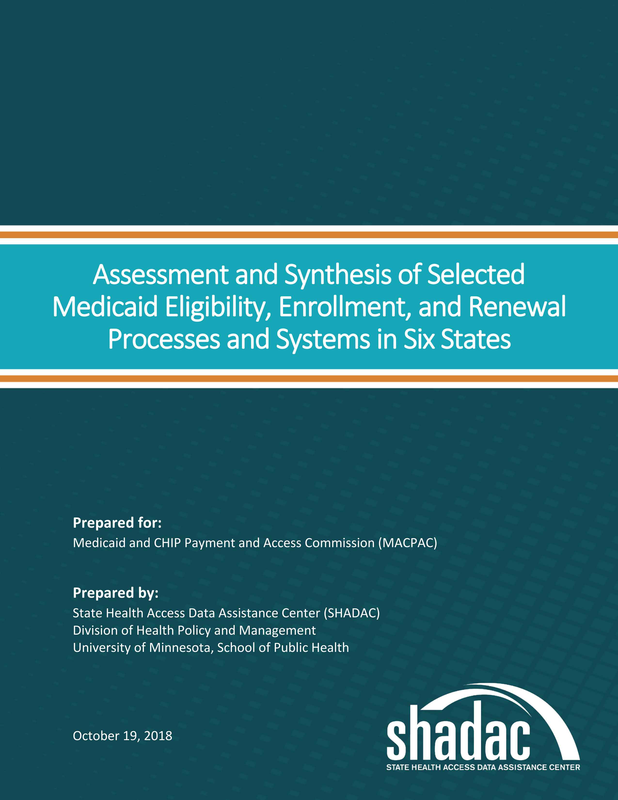 SHADAC recently conducted an assessment for the Medicaid and CHIP Payment and Access Commission (MACPAC) regarding Medicaid eligibility, enrollment, and renewal processes and systems in six study states—Arizona, Colorado, Florida, Idaho, New York, and North Carolina. This assessment sheds light on the different choices each of the study states has made regarding structuring their Medicaid programs and the continued implementation of the Patient Protection and Affordable Care Act’s (ACA) requirement of Medicaid eligibility simplification, along with state priorities. SHADAC’s study sought to both understand how the selected states—with varied Medicaid policy, program priorities, and ages and capabilities of their eligibility systems—enacted different approaches to streamlining their Medicaid enrollment and renewal processes for individuals whose income eligibility is based on Modified Adjusted Gross Income (MAGI), and to assess the extent to which states were achieving desired goals such as program efficiency and a simplified beneficiary experience. SHADAC used a multi-case study methodology and key informant interviews with 48 individuals representing state and local agencies and advocacy organizations to collect data on eligibility, enrollment, and renewal processes and systems for MAGI Medicaid populations. MACPAC was specifically interested in auto-enrollment and auto-renewal practices for MAGI Medicaid, the use of electronic data sources to verify beneficiary information, and the degree to which MAGI Medicaid enrollment and renewal is integrated with enrollment and renewal for non-MAGI Medicaid and other public benefit programs. SHADAC found that some states prioritized real-time, no-touch enrollment and renewal, while others prioritized eligibility worker involvement. All study states, however, focused on the transition to MAGI-based eligibility determinations and the use of electronic data sources to verify beneficiary information called for under the ACA. Multi-benefit online applications enhanced beneficiary access to programs and reduced burden, but back-end eligibility systems are complicated to maintain. Electronic data interfaces facilitated high rates of real-time eligibility determinations, auto-renewal, and reduced churn. Robust rules engines were critical to support successful streamlined eligibility determinations, but workers still need to understand policy. Complex and varied programs rules remained a challenge for integration of MAGI Medicaid and other programs. Despite streamlined application processes, demand for enrollment assistance was high. Monitoring of Medicaid and related policy changes continues. Respondents were closely monitoring potential Medicaid policy changes in their states, such as Medicaid expansion proposals in Idaho and proposed Medicaid work requirements in Arizona. Efforts to improve beneficiary and inter-agency correspondence are important and ongoing. Four of the study states (Arizona, Colorado, Florida, New York) reported beneficiary confusion arising from correspondence about eligibility determination and renewal, and three of these states (Colorado, Florida, New York) reported plans to improve this correspondence. Half the study states also reported ongoing efforts to improve inter-agency correspondence as well. States continue to invest staff resources and funding to improve application and eligibility system infrastructure. All six states are currently working to increase the usability of their application platforms and enhance their eligibility systems—shifting away from legacy mainframe systems toward rules-based systems and modular, cloud-based platforms. Read the full synthesis report and each of the state case studies for in-depth findings from this analysis.